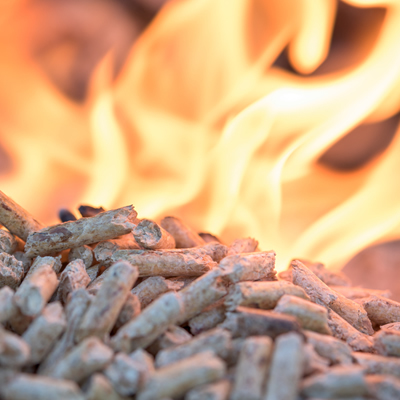 Wood pellets are a heating fuel made of clean, compressed sawdust. They are efficient, easy to use, and 100% natural, and they are becoming more popular for their cost savings and environmental benefits. How do I burn wood pellets? Wood pellets are burned in high efficiency stoves, fireplace inserts, and central heating systems. There is very little waste product from burning pellets (with a high quality brand of pellets, you’ll typically see about a quarter cup of ash per bag burned). We carry North Idaho burn pellets! North Idaho Energy Logs Super Premium Pellets – The clear bag lets you see the quality. Like their Energy Logs, these Premium Pellets are made entirely of wood by-products from sawmills and have no additives. The high density and low moisture content of the Premium Pellets enables it to pack 8400 BTU’s per pound, and creates less than 1/2 of 1% ash. Starting with only high quality fiber, North Idaho makes a consistent, high quality wood pellet that our customers have been heating their home with for years. North Idaho is committed to finding the only the best raw materials and continually finding ways to improve this product. Available in 40 lb bags, 50 bags per pallet. Be sure to protect your pellets from moist environments.